This is my new buddy, Gavin, who doesn’t live very far from me. He can’t wait until summer when he gets to JUMP IN THE POOL AND SWIM! 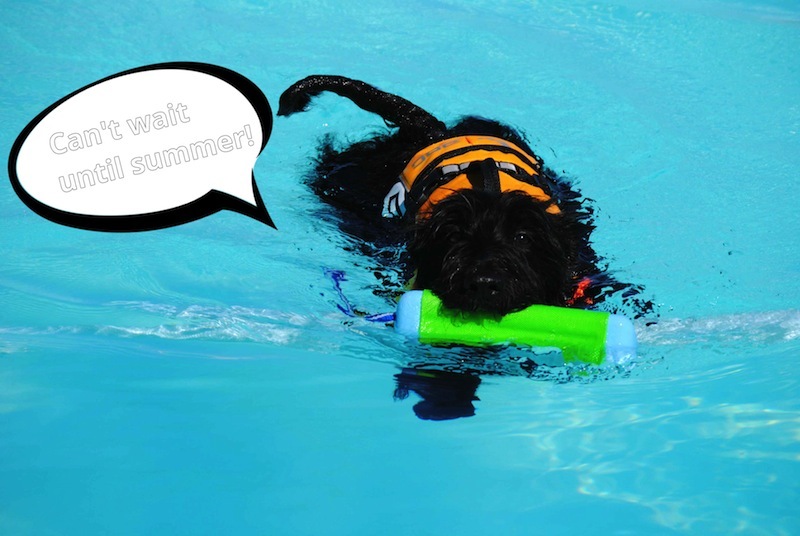 Now, how does a Scottie swim? I don’t get it. Woot! If I did that I’d sink even WITH a life preserver on. I think the peep is thinking of planning a Scottie meet up near us since there are so many Scotties around. Stay tuned for that. 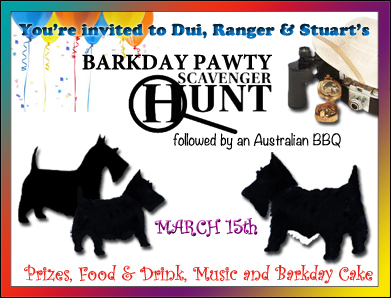 DON’T FORGET ABOUT OUR BARKDAY CELEBRATION THIS SUNDAY! This entry was posted in dogs with blogs, The Scottie Chronicles and tagged dogs, photography, Scotties, Scottish Terriers. Bookmark the permalink. Hi Gavin! You are lucky to be close to Stuart. He will show you the ropes. Hope you have lots of play dates. Oh yeah…..how do you stay afloat? Me and Andy sink like a stone. The Peeps won’t let us near our pool in the summer. All of my Scotties have hated water. I think that Sophie will be the exception. Kyla was panicked just standing in the pool on the step in an inch of water. FREAK OUT! Gavin it’s so hot here I wish I was in the pool with you! Well…I love water…but have never gone swimming…just gots a wading pool, sprinklers and rain….Bites he don’t like anything that gets him wet! Wow, how cool is that! A new buddy and play dates! I don’t have any Scottie friends…wish I lived closer. I’m happy for you both! We would love to swim with yous! Getting our instruments tuned for the pawty! Our Border Collie fell in the pool once when his focus on his ball got the better of him and he accidentally fell in. Humph! Not a happy camper!